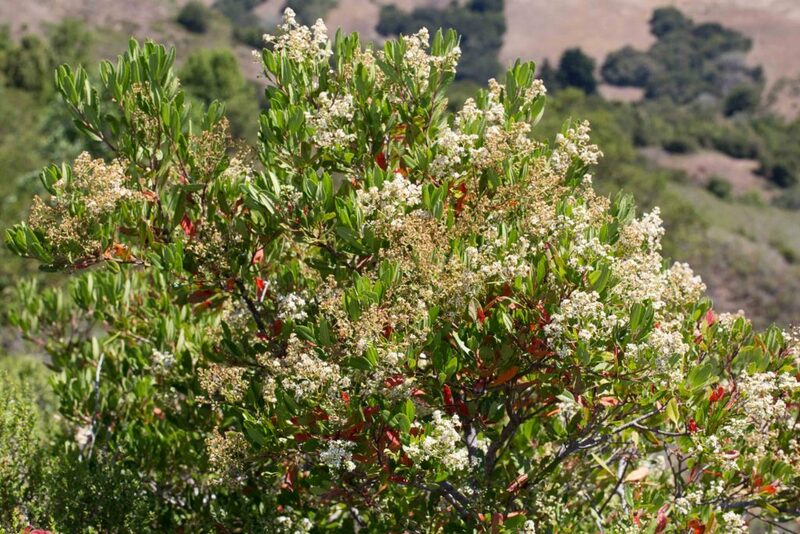 This is a large shrub, very common in chaparral, with clusters of small narrow pointed leaves (the “fascicles” which give the plant its scientific name) and a mass of tiny white flowers which produce a spectacular display in early summer. 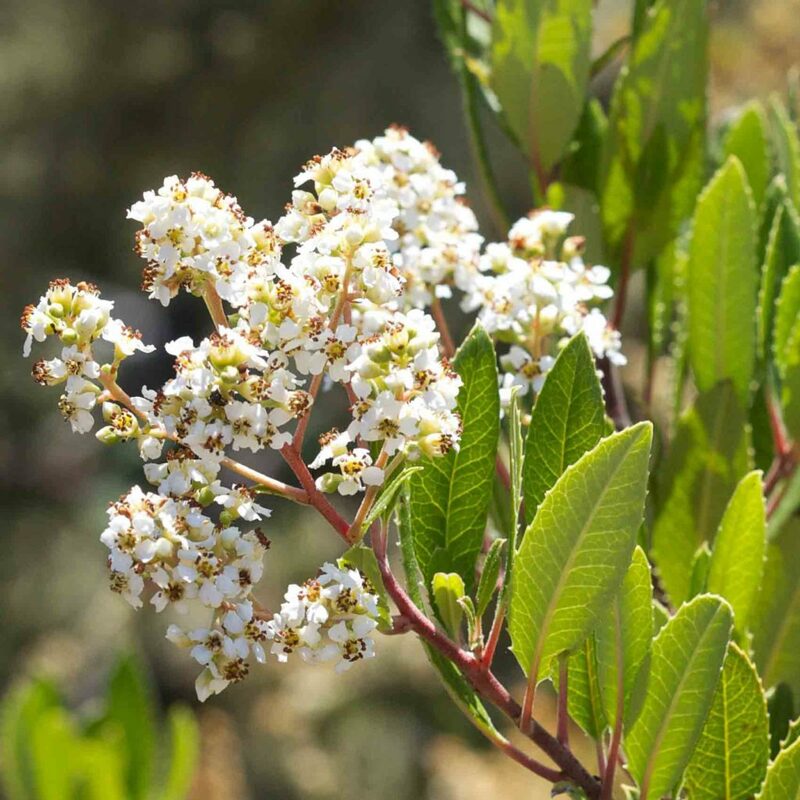 Like som other chaparral plants, Chamise is “allelopathic”, i.e. 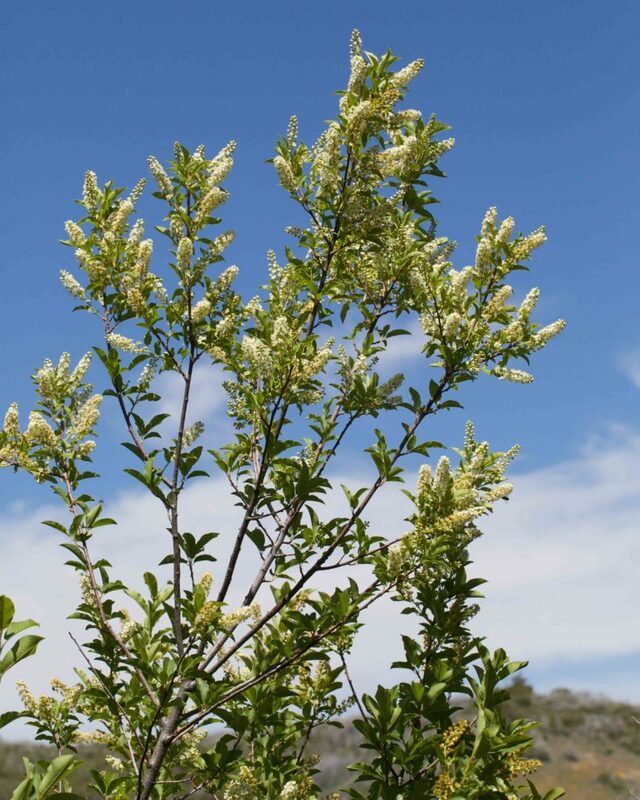 it releases a toxin that inhibits the growth of other plants in the vicinity. 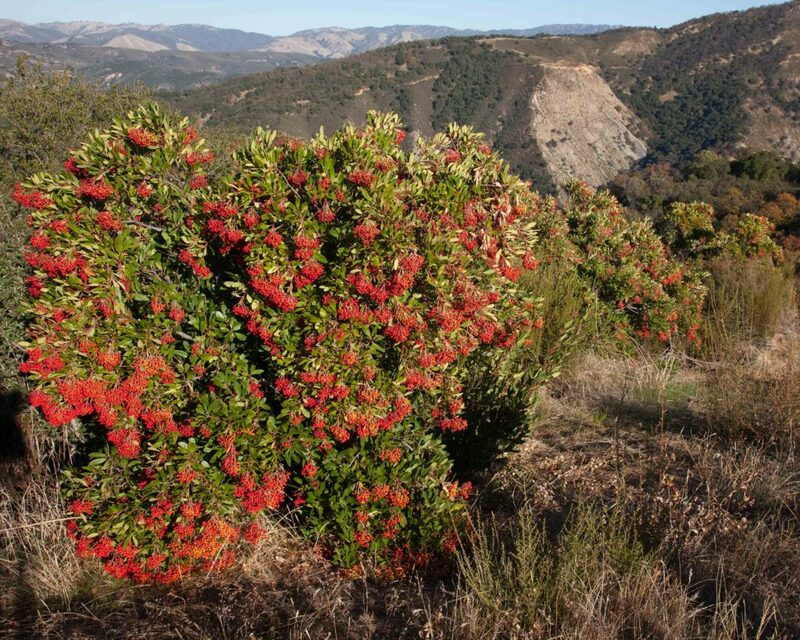 Like certain Manzanitas, Chamise develops a burl (although invisible because underground). 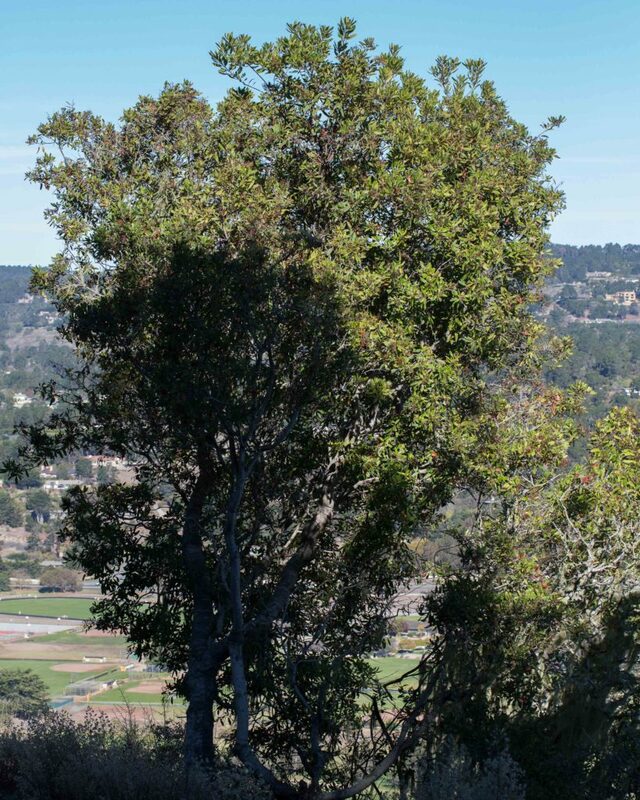 This burl is a repository of dormant buds that are stimulated by fire so that the plant is able to resprout even following a fire which destroys everything that was above ground. 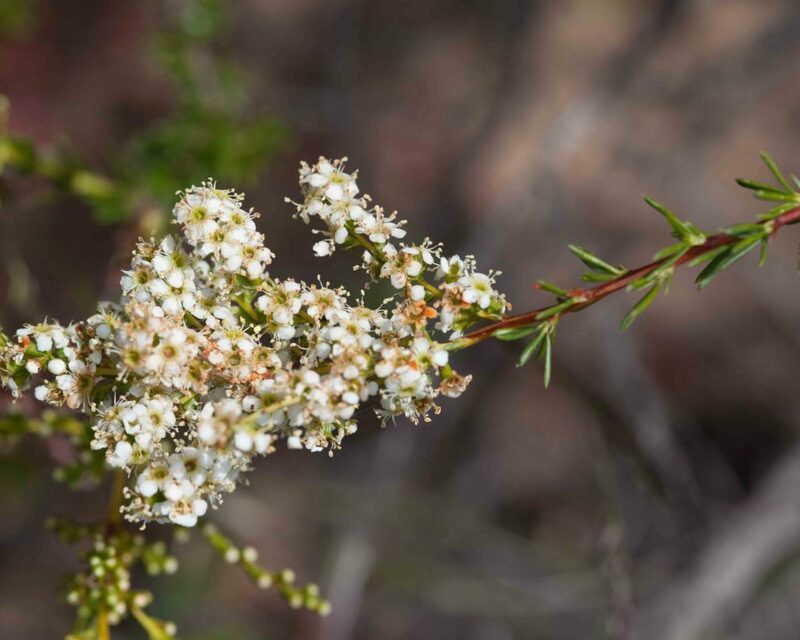 Another consequence of the fire is that the heat vaporizes the allelopathic toxins which explains how it is possible for the fire following herbaceous plants to flourish and put on such a spectacular display in the few years following a destructive fire. 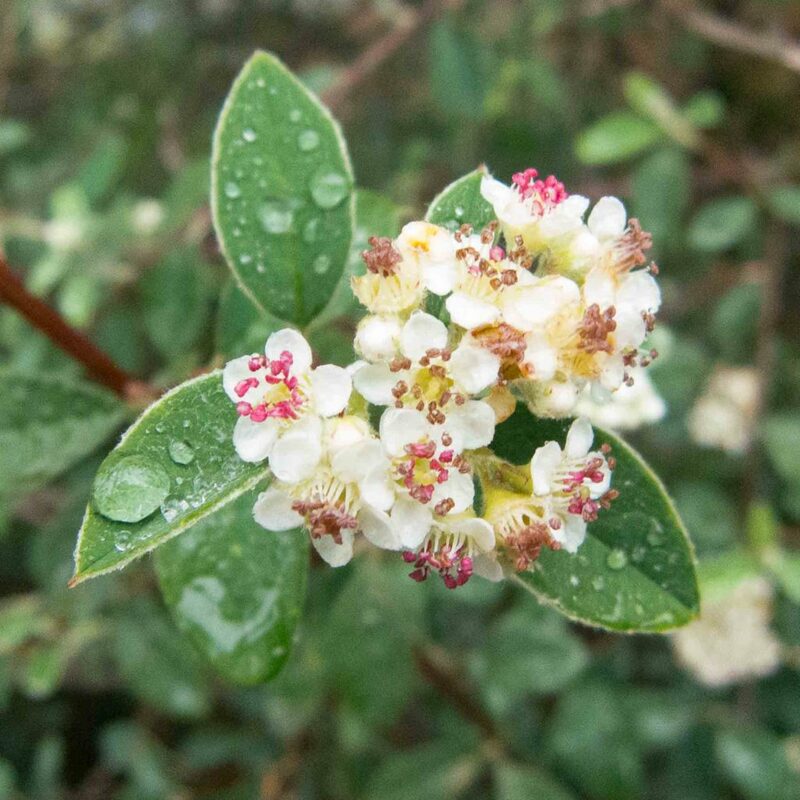 A common large shrub or small tree. 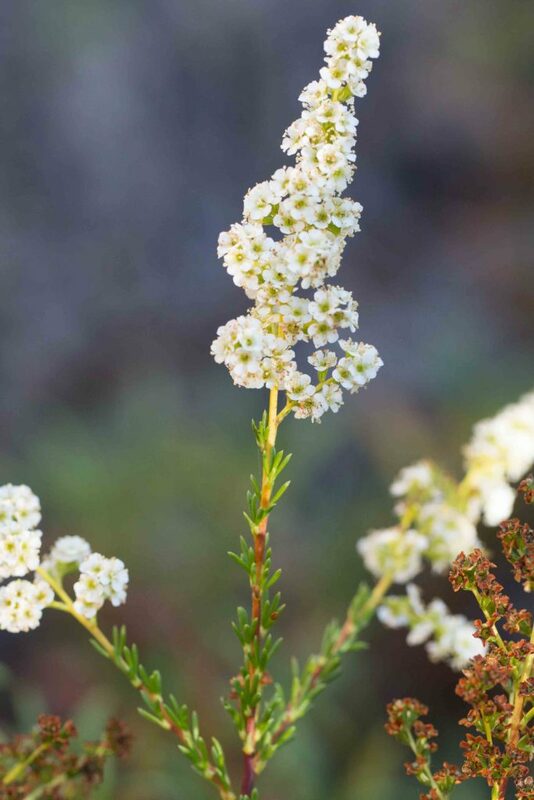 Throughout the year it is easily identified by its tough, elliptic leaves with markedly serrated margins. 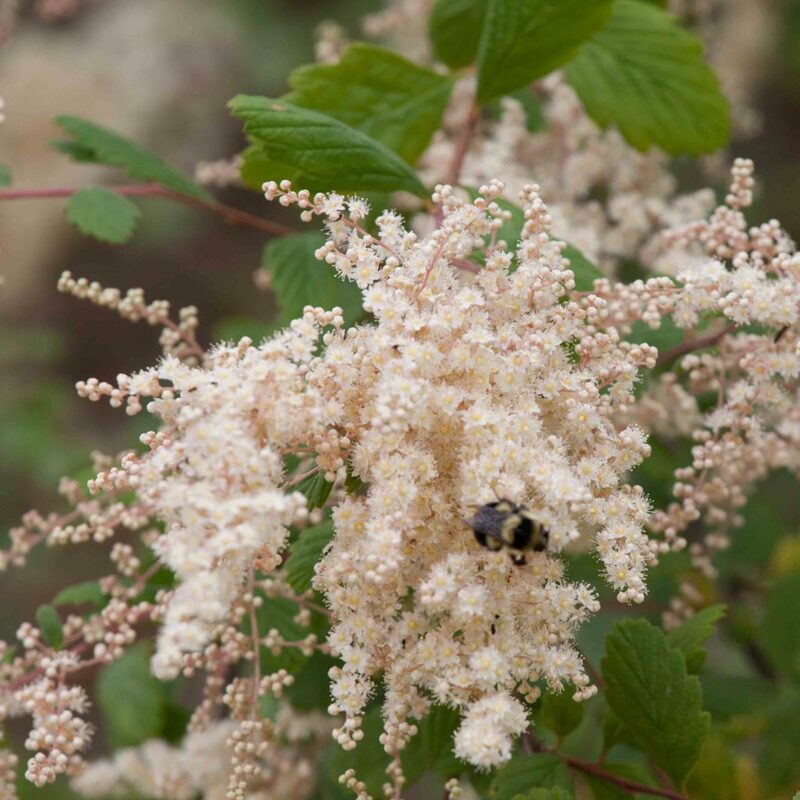 It produces a mass of attractive white flowers in early summers followed by berries which turn bright red in late fall to early winter — hence the plant’s alternative common name. 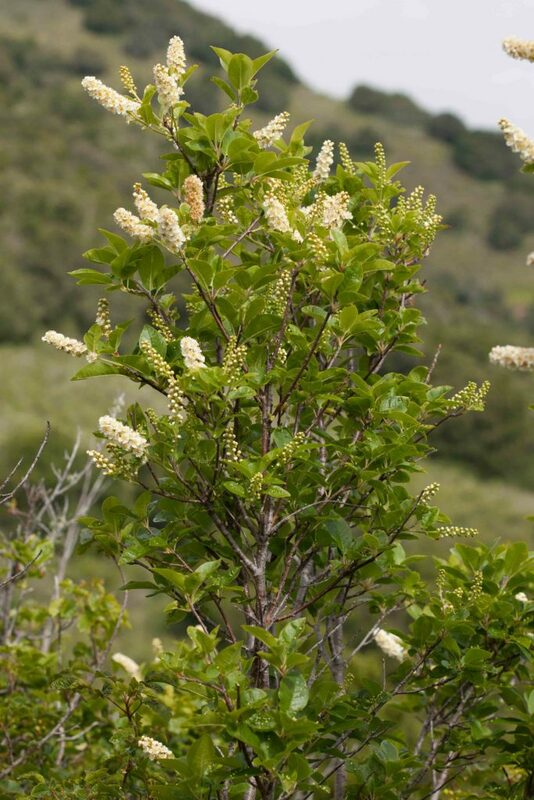 A large spreading shrub. 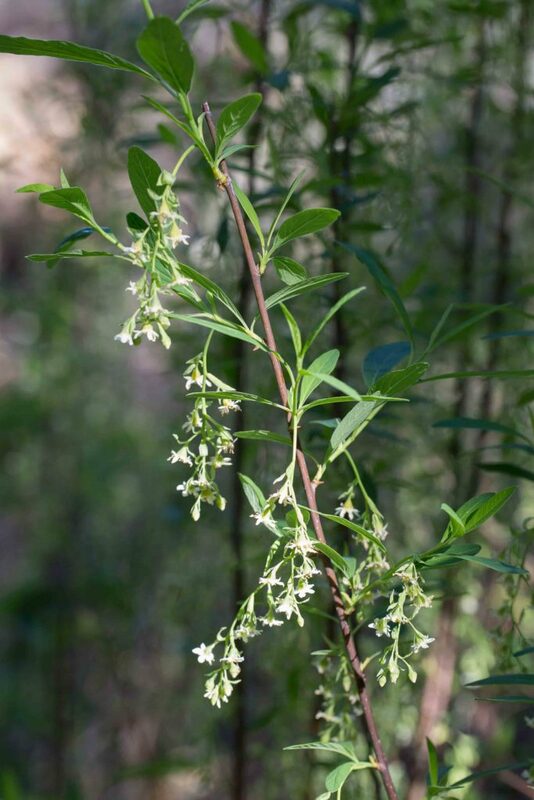 The flowers are small, creamy white, sometimes pink-tinged, in large dense drooping panicles up to 25 cm long. 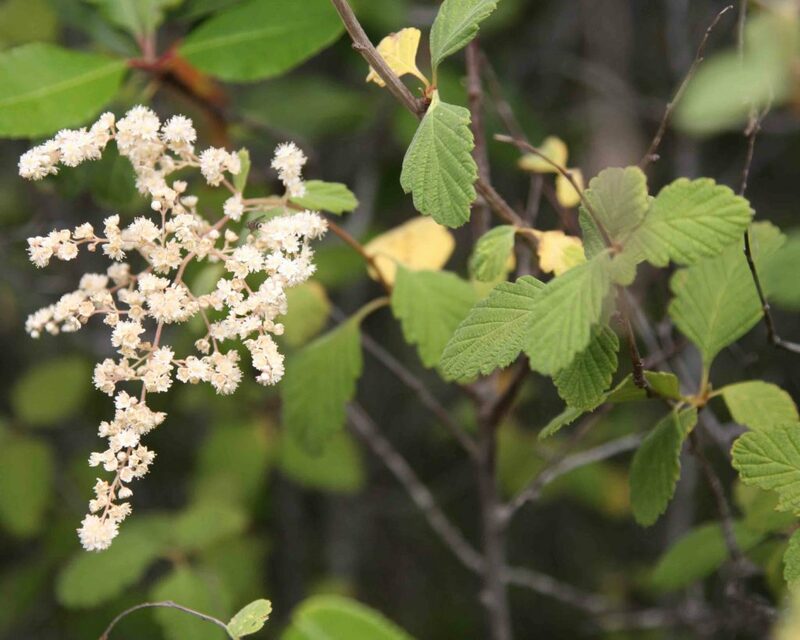 The leaves are distinctive, ovate to obovate with a rounded or truncate base and toothed margins. 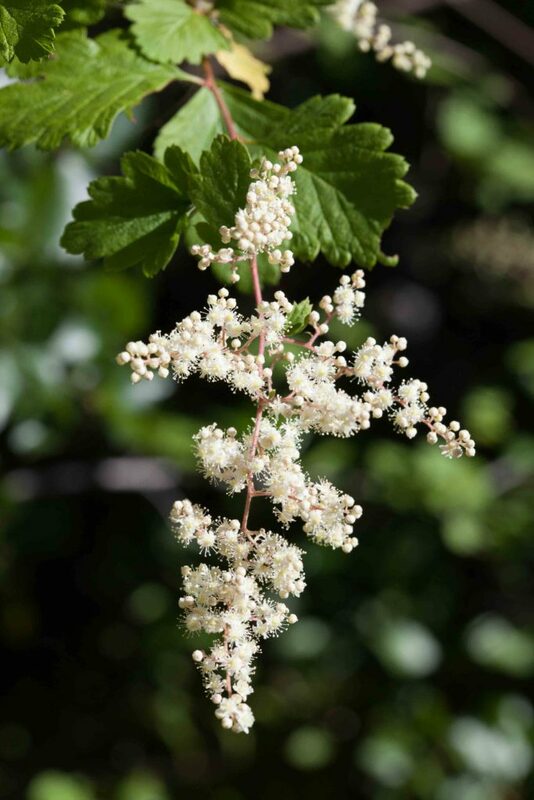 It has been facetiously suggested that the name “Ocean Spray” should be reserved for plants found by the immediate coast but any difference in common names is not reflected by any difference in the appearance of the plants themselves. 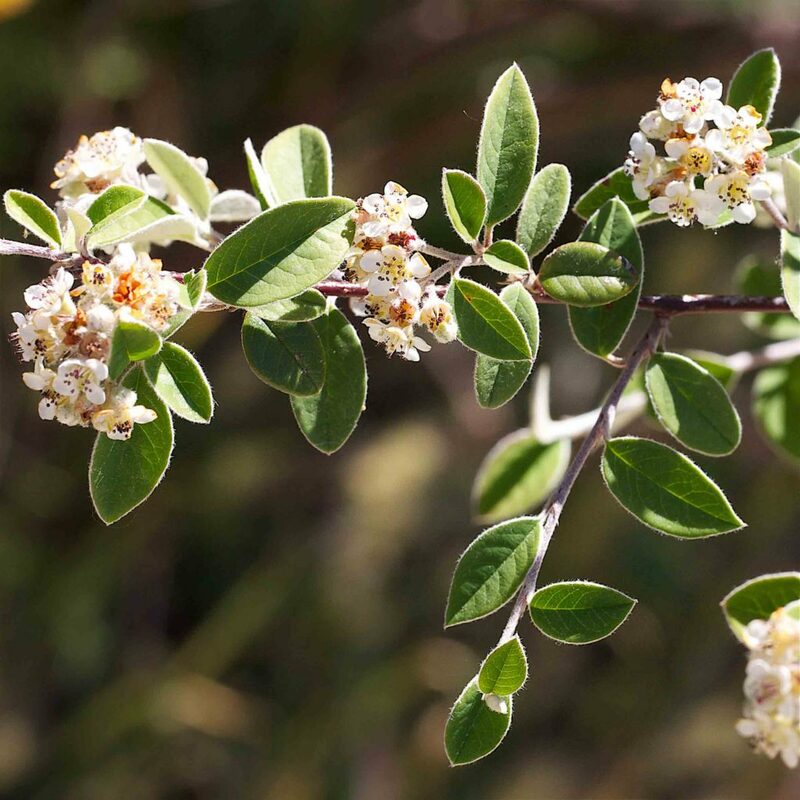 A large fragrant shrub or small tree with an open growth habit. 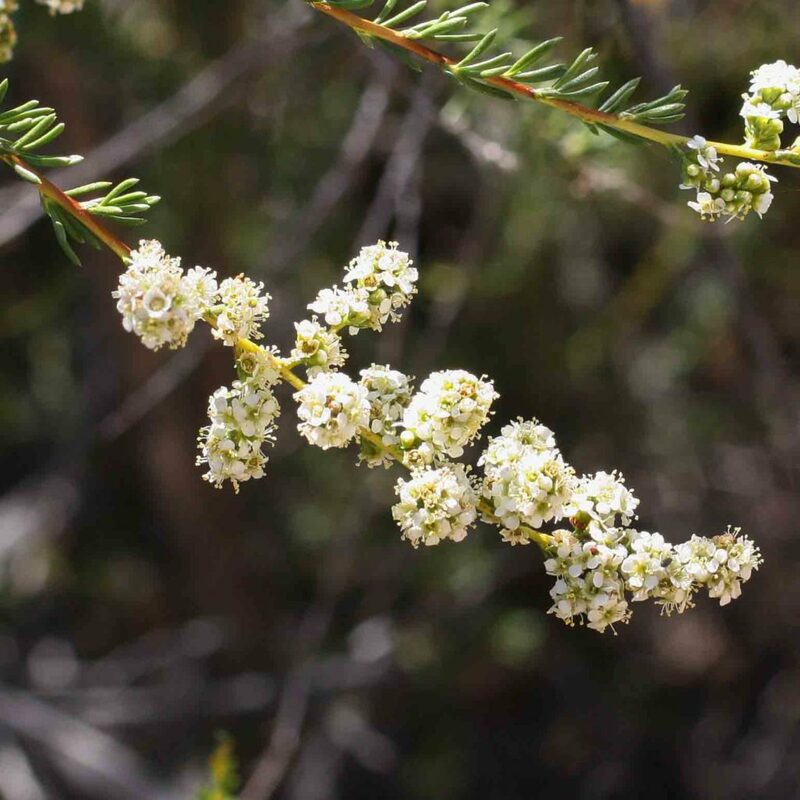 It is dioecious with male and female flowers borne on separate plants. 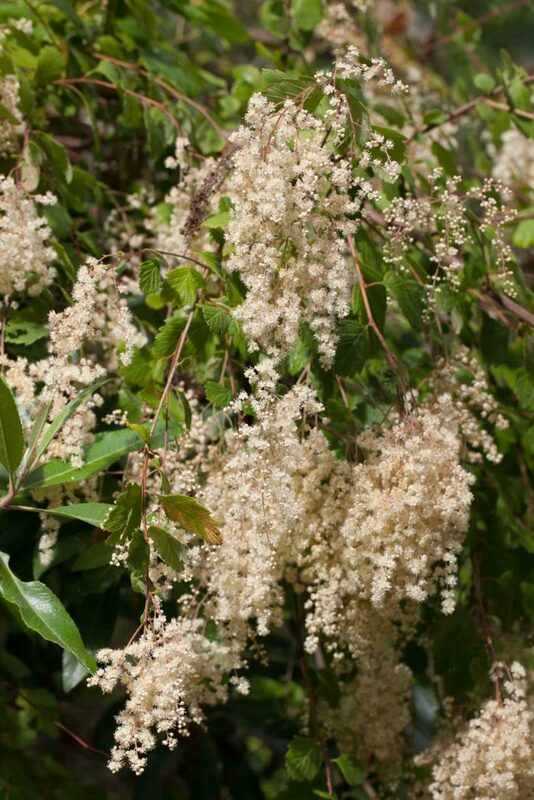 The flowers are white and bell-shaped, in distinctive pendulous clusters. 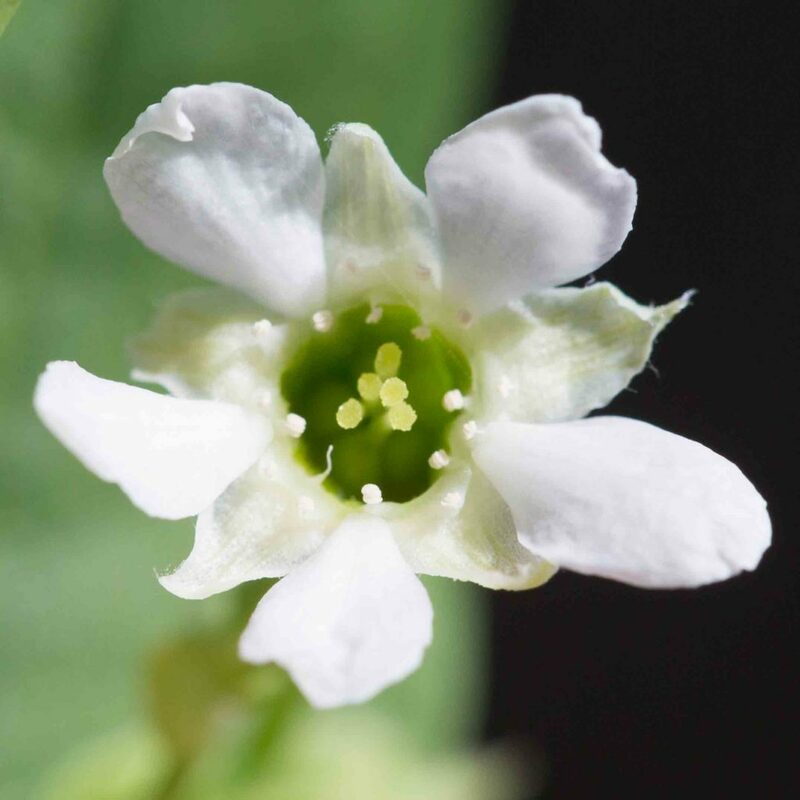 The male and female flowers are similar but for the stamens in the one and the pistils (surrounded by sterile stamens) in the other. 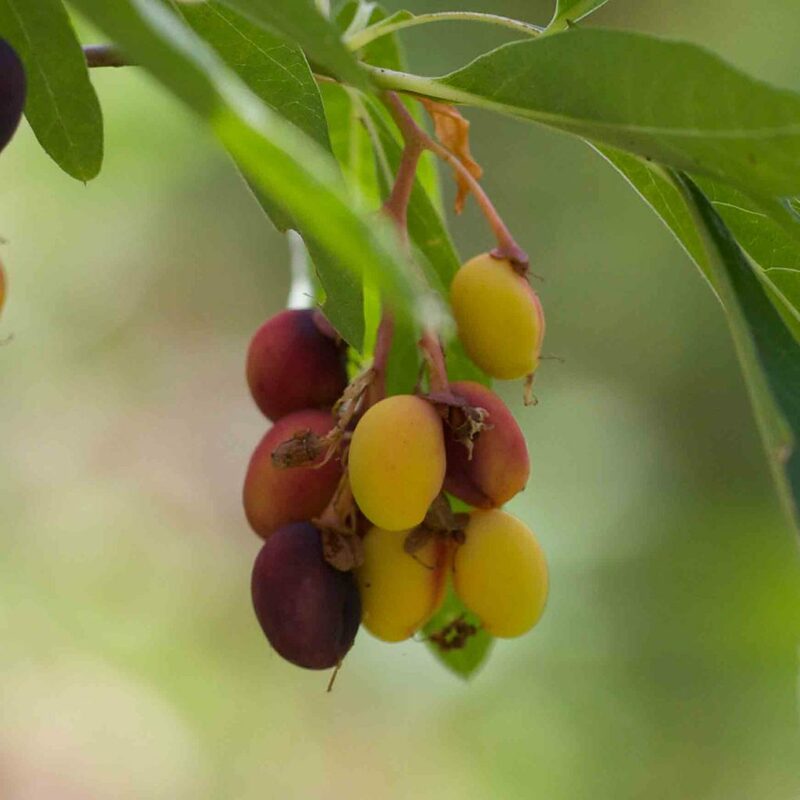 Fruits are yellow, turning reddish and finally blue-black, edible if no better alternative can be found. 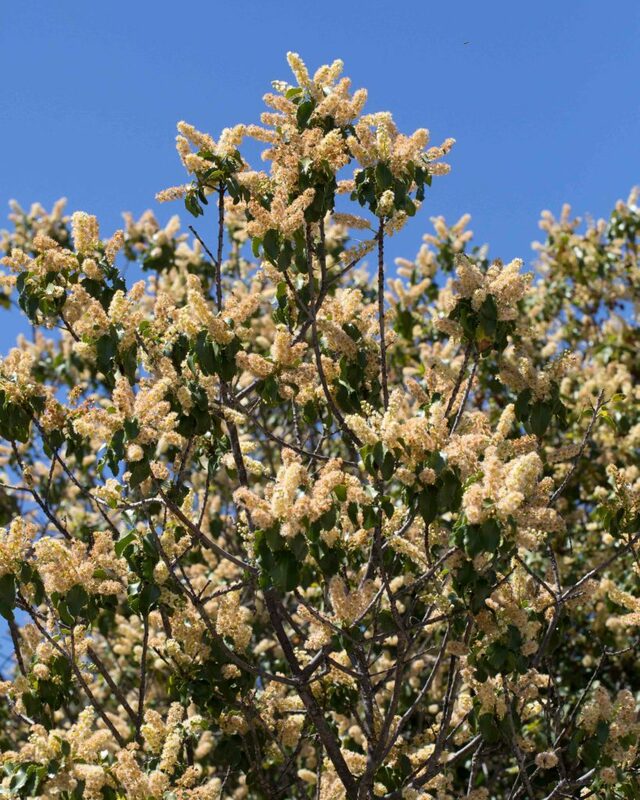 A large erect shrub or small tree. 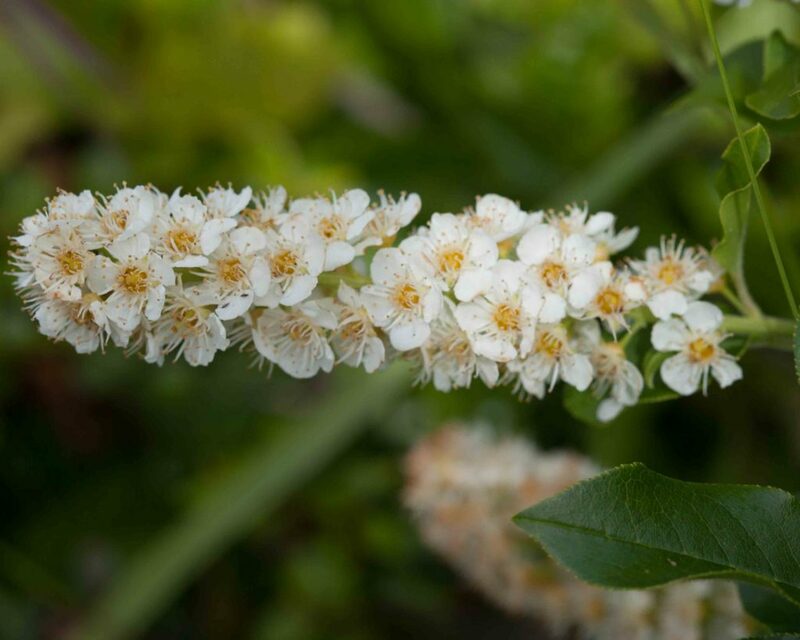 Like Holly-leaved Cherry (Prunus ilicifolia), this has large clusters of creamy-white flowers in elongated racemes. 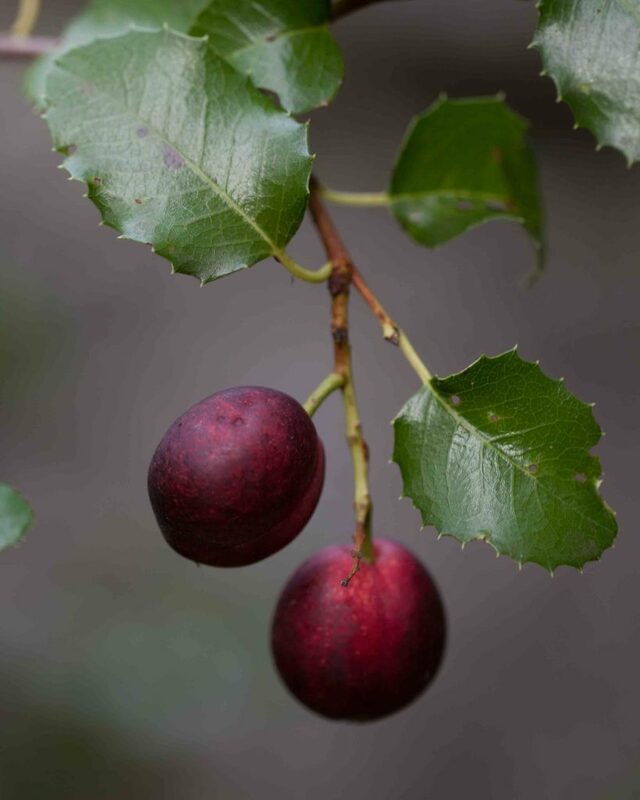 The fruit is dark red to black, astringent and should not be eaten straight off the tree. 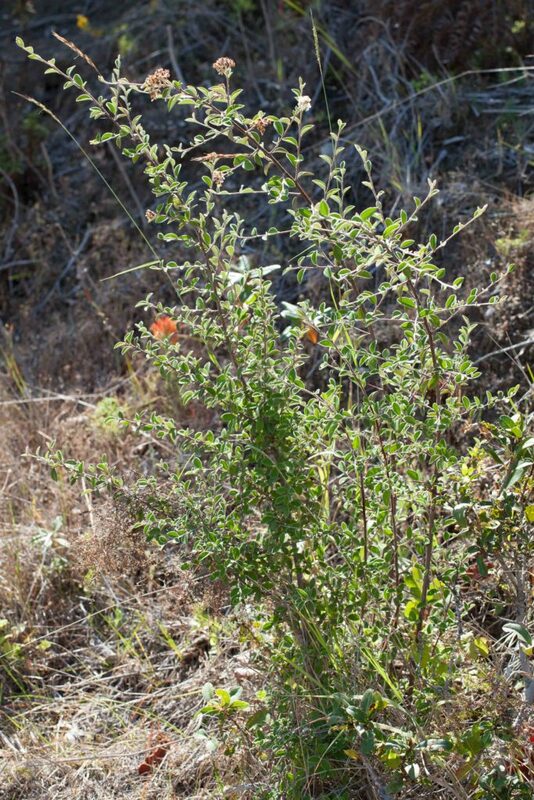 The leaves are 3–10 cm, thin, elliptic to oblanceolate with finely serrated but not spiny margins. 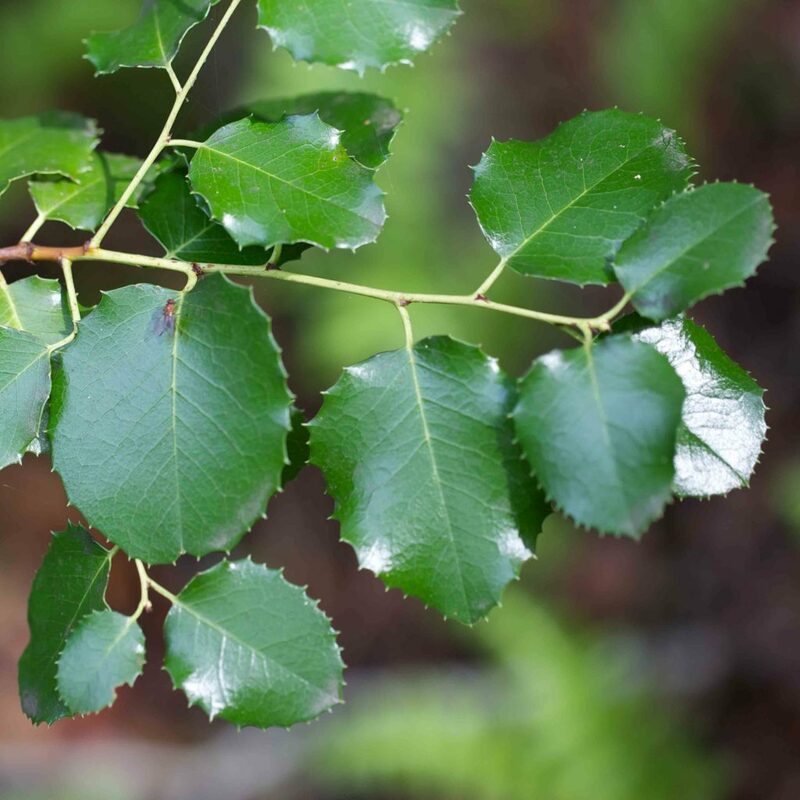 The leaves contain hydrocyanic acid and are therefore toxic. 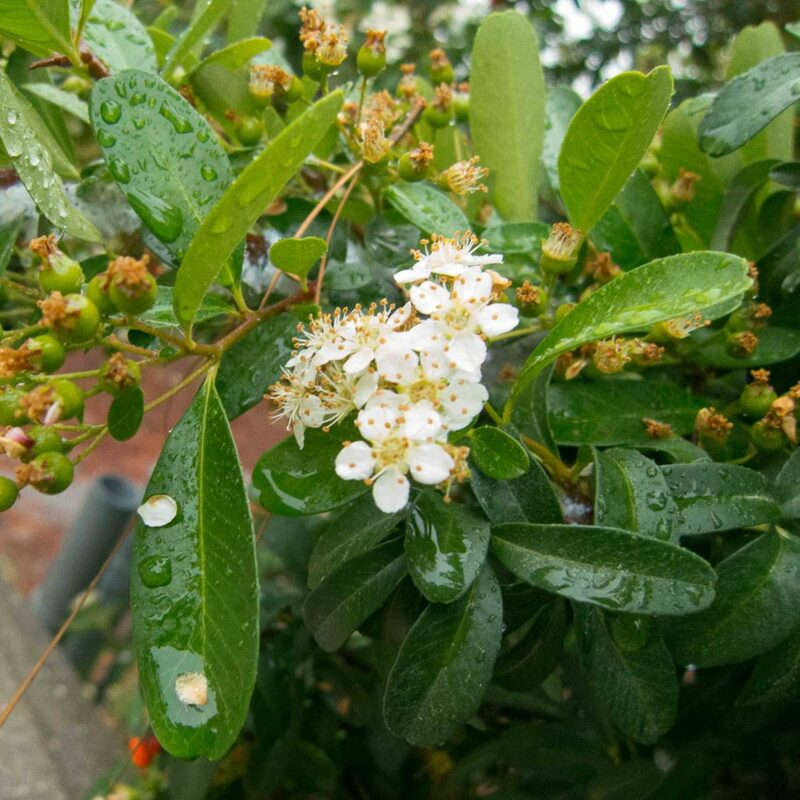 A large erect shrub or small tree. 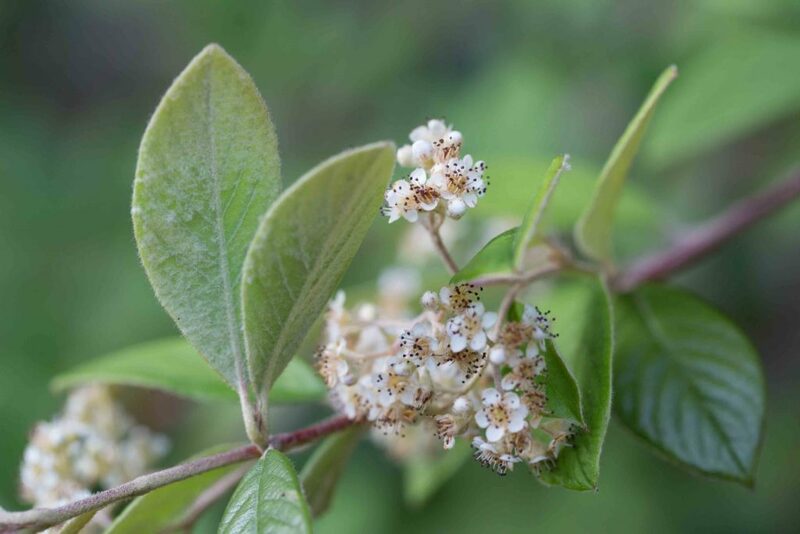 Like Western Chokecherry (Prunus virginiana), this has large clusters of creamy-white flowers in elongated racemes. 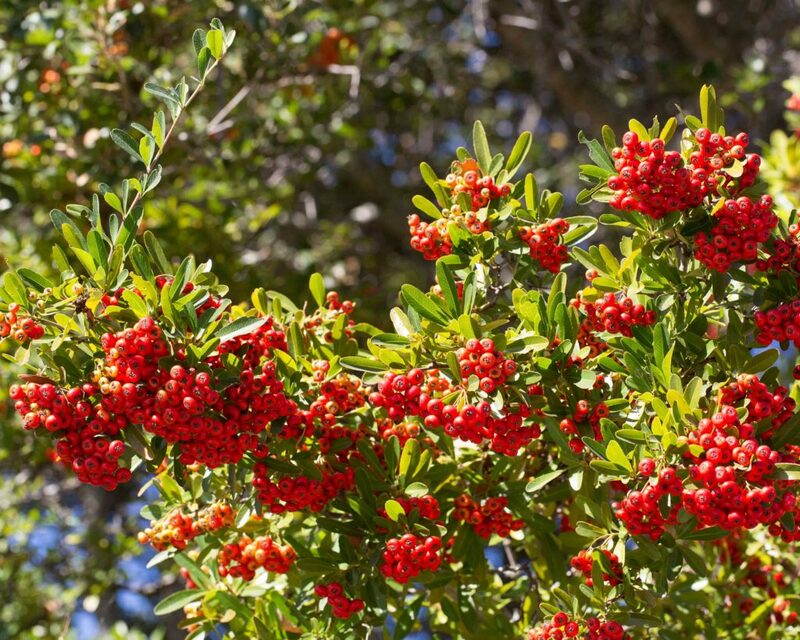 The fruit is red to yellow, edible but with no great pleasure. 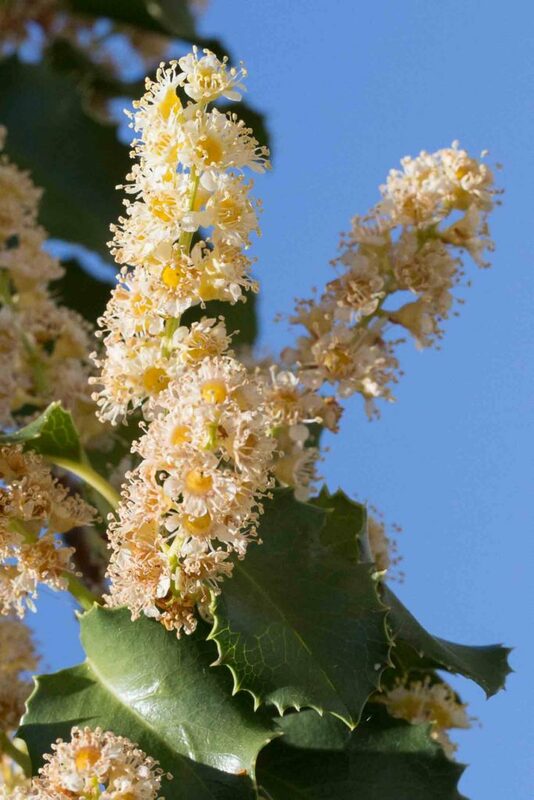 The leaves are evergreen, leathery, ovate to round an spiny-margined. 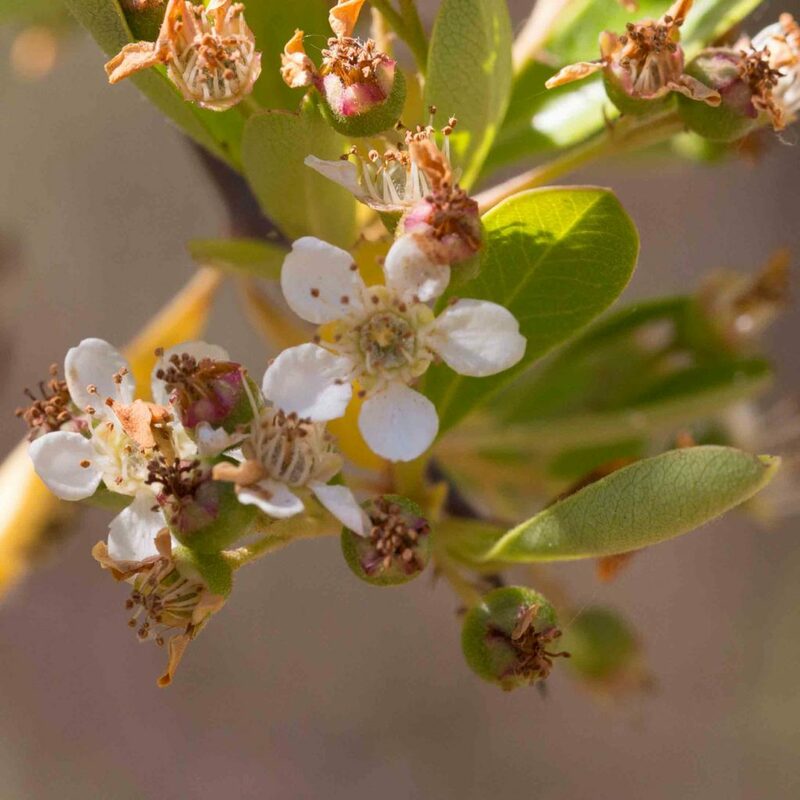 If crushed, they give off a strong bitter almond smell. 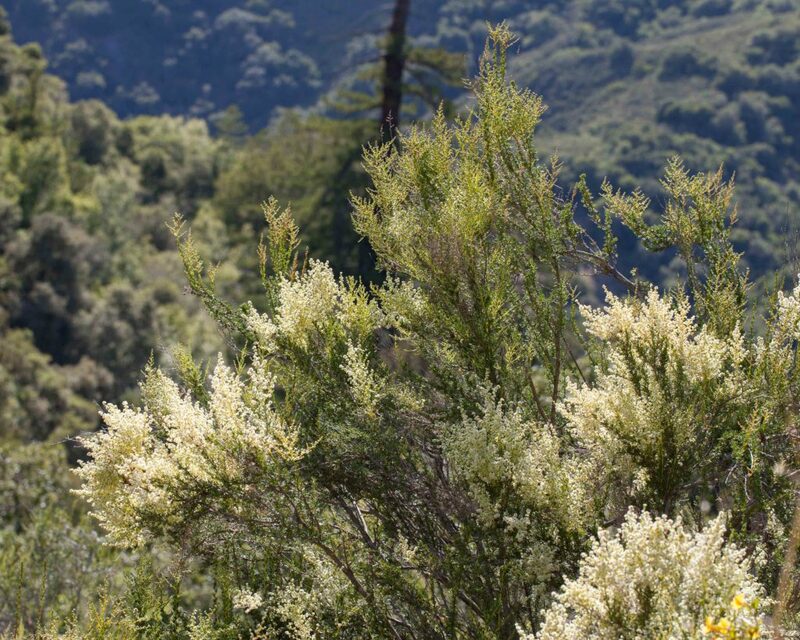 They could be confused with the leaves of Coast Live Oak but they lack the tufts of hairs in vein axils on the lower surface. 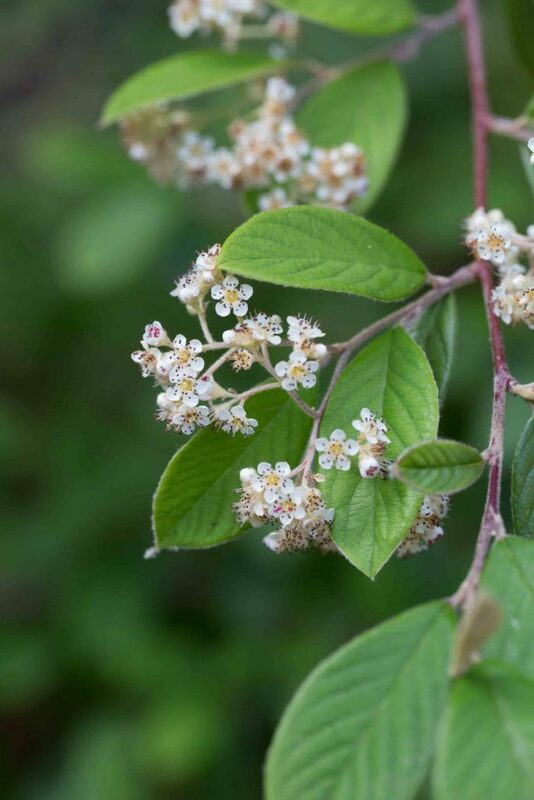 Frequently cultivated and sometimes escaping, this can be a large shrub, loosely branched and with clusters of small white flowers followed by bright red berries. 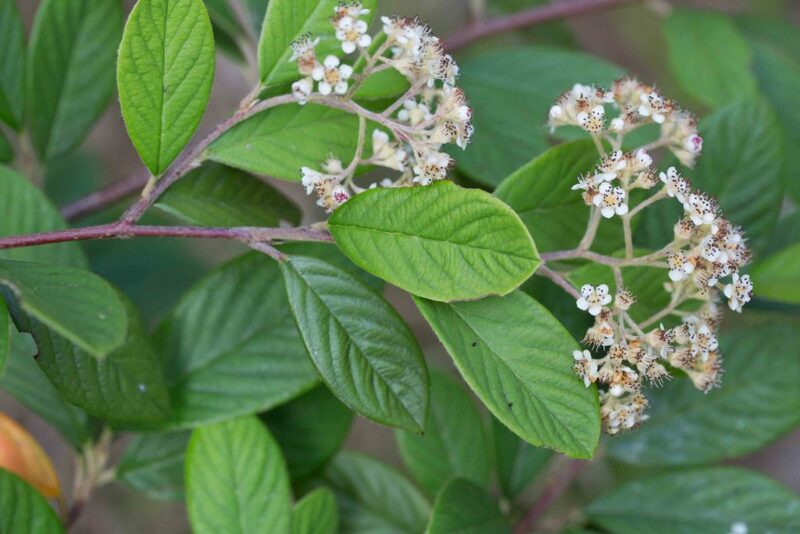 Its leaves are elliptic to obovate, 35–95 mm long, dark green above, pale tomentose below and with sunken veins. 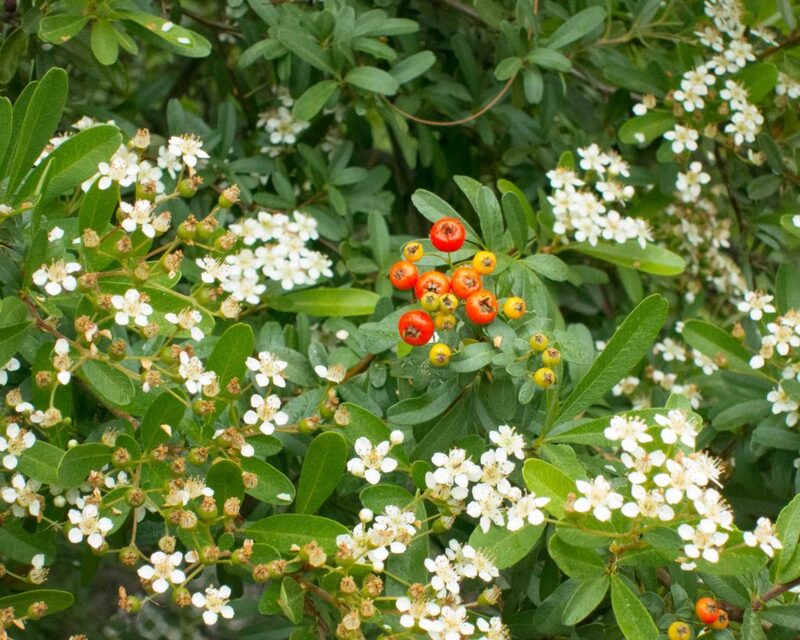 Frequently cultivated and sometimes escaping, this is a loosely branched shrub with clusters of small white flowers followed by bright red berries. 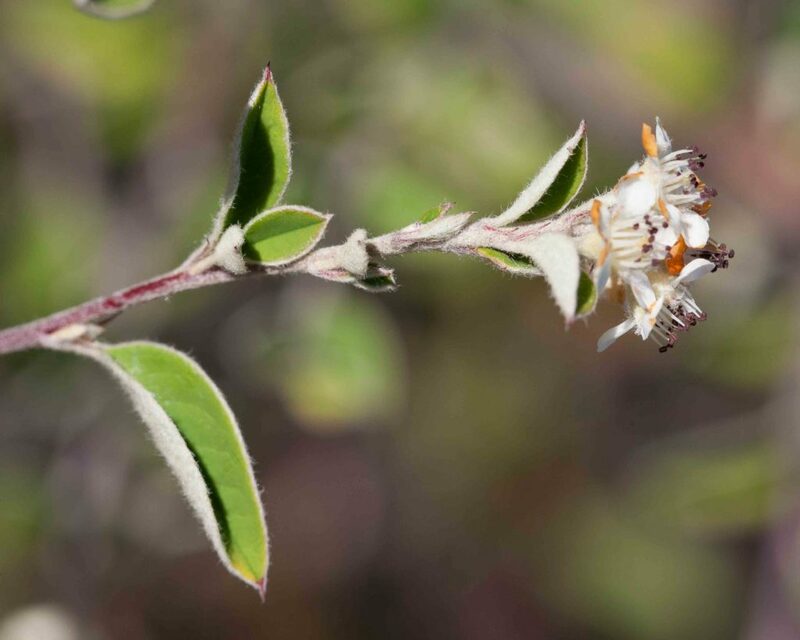 Its leaves are smaller than those of Late Cotoneaster (Cotoneaster lacteus), elliptic to obovate in shape but only 15–32 mm long, dull bluish-green above and white-tomentose below. Its veins are not sunken. 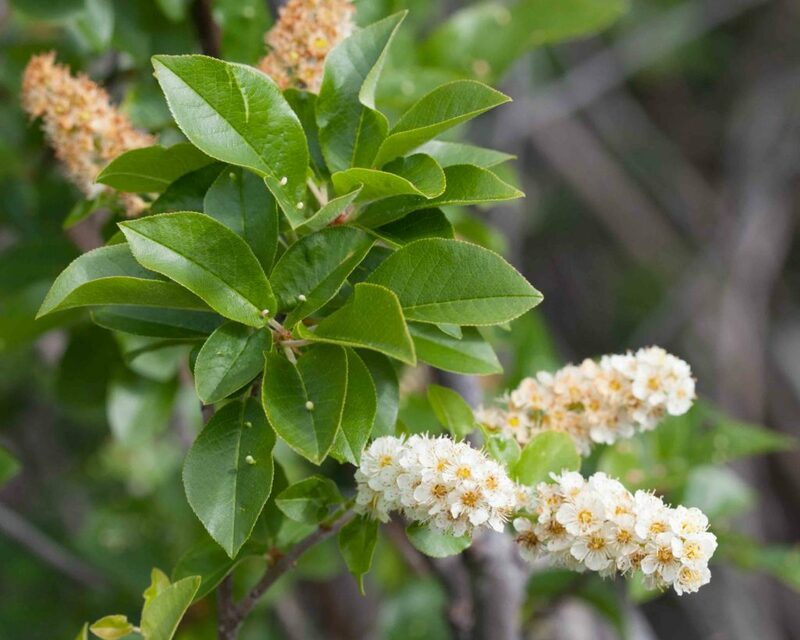 A large evergreen shrub with oblong-obovate leaves 15–60 mm long with obtuse or more or less notched tip. 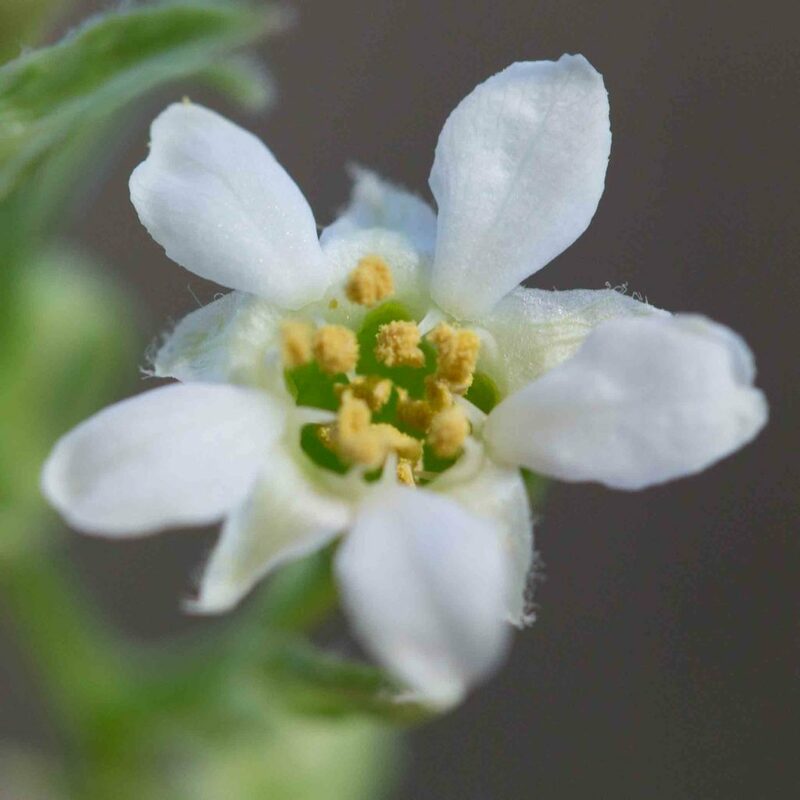 Small white flowers are born in large dense racemes, producing bright red berries later in the year.